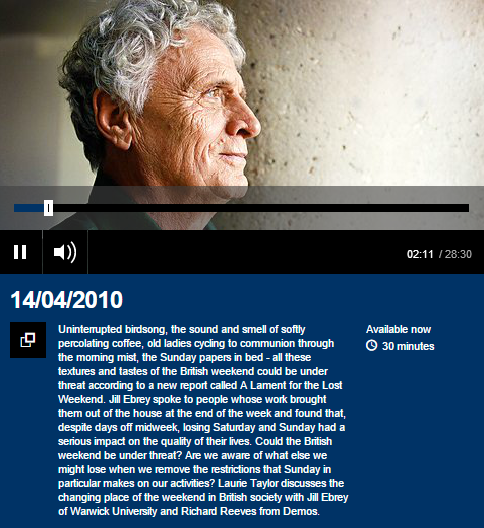 This programme, first broadcast in 2010, introduces the weekend as a subject for debate. Featuring Jill Ebrey and Richard Reeves (Director of the think tank Demos), it traces a history of the weekend from its origins in the nineteenth century Saturday half-day holiday, through a high point in the second half of the twentieth century to its possible demise in the deregulated twenty first century. 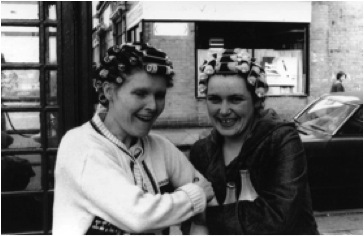 Based around Jill’s research with supermarket workers in Salford, it considers how everyday participation in the social and collective life of the weekend is constrained by working on Saturdays and Sundays. ‘The weekend’ as an ‘autonomous’ time and space, separate from the working week is a modern invention, produced through the ‘logic’ of a developing capitalist economy during the industrial revolution of the eighteenth and nineteenth centuries. This spatio-temporal reassemblage imposed a temporal discipline on both work and leisure in everyday life, making it much more regimented and predictable. The idea of leisure came out of this stratification of time and space, ensuring that ‘fun’ was confined to specific days and times in the week rather than being scattered through the calendar, as had been traditional fairs and holidays. Perhaps paradoxically, out of this new regime came the weekend and all that it stands for – time for one’s self, consumption, hedonism, sport, all of those activities that became eventually understood as ‘leisure’. Work and leisure now had their own times and spaces delineated specifically as such. The idea of ‘the weekend’ meant that Saturdays and Sundays gained ‘a spontaneous existence’, a separateness from the week that indicated their ‘difference’, as ‘alternative’ or ‘out of the ordinary’ (Rybczynski, 1991). From being merely ‘the end of the week’, ‘the weekend’ became ‘a separate time and space with a life of its own’ (Zerubavel, 1985:108). What might be the link between everyday participation and the weekend? Nowotny (1994) suggests that the concept of ‘proper time’, viewed as ‘self time…from the perspective of the individual’, came about as an idea of ‘partial release from common social time’ as the idea of ‘private family time’ gained currency. The pleasure of time to ones self (‘I-time’), Nowotny argues, was ‘a novel production of time’ and one that was fought for by the labour movement. The temporal and spatial reorganisation of the Industrial Revolution produced the weekend, and a time and space for ‘proper time’ was institutionalised as a ‘reward’ at the end of the working week (though of course, a caveat must be, that this I-time was gendered, with women having less access to it than men) after much agitation by various constituencies. ‘Proper time’ meant that there was a space for participation in activities outside of home and work. This was also produced by capital as ‘consumption time’, where the sale of goods made in the new industries were displayed and marketed in the shopping streets of the new urban centres. At the same time, the commodification of traditional activities such as singing, dancing and playing sport and their subsequent accessibility to urban audiences meant that there was an element of choice (for some) about how they might spend their time at the weekend. Subsequently, the weekend has become a time and space for participation in a panoply of activities from the pub on a Friday night, through football or shopping on Saturday afternoons, to the allotment on Sunday, with Friday night as the high point of anticipation and Sunday evening as the ‘quiet’ precursor of another busy week. The weekend potentially provides a designated time and space for getting together with others and doing interesting things, for inhabiting a shared time and space with shared activities. There is some evidence to suggest that globalisation and deregulation are producing a week of days that doesn’t include the hitherto heterogeneous quality of ‘marked’ (weekend) days and ‘unmarked’ weekdays, (Zerubavel: 1985). Given this seeming breakdown of the weekend, particularly for those working in the service sector (Ebrey and Cruz: 2014), it remains to be seen what the consequences of a decline in shared times and spaces will have, for the possibilities of temporal and spatial synchrony, of participating collectively in shared interests. Nowotny, H. (1994). Time: the Modern and Postmodern Experience, Cambridge: Polity. Rybczynski, W. (1991). Waiting for the Weekend, New York, NY: Penguin. Zerubavel, E. (1985). The Seven Day Circle: The History and Meaning of the Week, New York: Free Press. This entry was posted in Uncategorized and tagged British weekend, community gardening, demos, Laurie Taylor, leisure, participation, Richard reeves, thinking allowed, weekend by Susan Oman. Bookmark the permalink.